Have you ever wondered what is was like to be an undergraduate researcher? Do you have questions about how to manage research with classes/work/life, benefits/challenges in research and more? 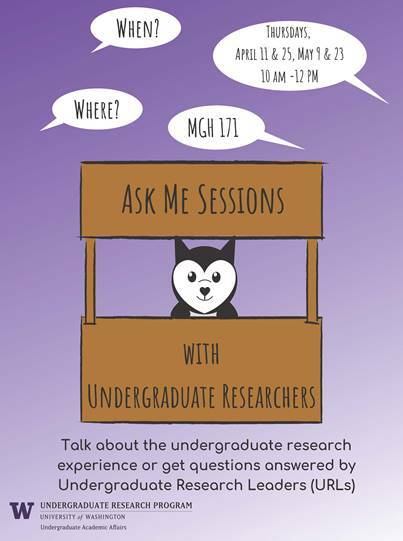 Come to the “Ask Me Sessions”, where you can sit down with Undergraduate Researcher Leaders, current undergraduate students conducting research in a variety of fields, and get a take on their research experience at UW or talk about your own experience with research. The sessions will be held on the following Thursdays (4/11, 4/25, 5/9, 5/23) from 10am-12pm in 171 Mary Gates Hall. Are you interested in wildlife conservation? Do you want to gain field work experience this summer? If so, please consider applying for the UW Quantitative Ecology Lab’s wildlife research volunteer position (attached). This summer position will focus on deploying and maintaining camera traps in eastern Washington as part of the Washington Predator-Prey Project. Deadline to apply is April 5th, 2019. Below are the details of the annual essay prize organized by The Gardens Trust, together with information about their New Research Symposium for any student who might be working on any garden or landscape history related topic. Even though this is from a UK based organization, both competitions are aimed at an international audience, and in recent years there has been several entrants for the essay prize, as well as several presenters at the symposium, from the US. Calling fellow UW students in or interested in the field of biomedical research! We want to create a forum to connect people across departments with opportunities relevant to the mission of supporting underrepresented minorities in the biomedical field with an emphasis on research, networking, and community. To achieve this goal, we are creating a UW Registered Student Organization (RSO) geared towards supporting individuals of diverse racial, ethnic, and socioeconomic status, and all allies. We aim to provide the necessary tools for undergraduate, graduate, and postdoc trainees in their future endeavors. We envision mentorship, workshops, career fairs, and monthly networking, both academia and industry focused, across student levels and by faculty. Additionally, through a newsletter, we hope to work with existing organizations to compile relevant opportunities in a central and accessible location. We recognize the interdisciplinary nature of biomedical research and call upon interested individuals across all relevant departments to join us. In an effort to define and tailor the goals of the organization and serve the needs of members, we invite you to our first general meeting on March 6th, at 5:30pm in MolES room 215. In this meeting, we will vote on an organization name, so come with suggestions! The Undergraduate Research Program is pleased to announce the call for applications for the 2019 Summer Institute in the Arts & Humanities (SIAH)! SIAH offers an opportunity for undergraduates to engage in scholarly research with accomplished faculty, graduate students, and peers while earning full-time academic credit. This year’s theme is Creating Alternate Worlds. Over the course of the summer, students will explore the world building practices in design, literature, gaming, art, afrofuturism, philosophy, and science to create worlds that reflect their ethical, intellectual, and creative commitments. To learn more about the 2019 program theme, faculty team, application process and to sign up for an information session, visit our website. We hope that you consider applying for this terrific research and learning opportunity! Are you a graduate or upper level undergraduate conducting research in restoration of Northwest natural systems, or know of one? Check out SERNW 2019 Grant Offerings! 1. A cover page including project title, name, current mailing address, e-mail address, study system and location, college or institution, SER membership status, and dollar amount requested. 2. The research proposal, including an abstract (<250 words), introduction with research questions and objectives, methods, expected results, project significance, and literature cited. Tables and figures should be embedded in the text. Page limit of 3 to 4 single-spaced pages, excluding references. Please clearly state how your research supports restoration. 4. Budget and justification, and research partners if any. 5. A 1 to 2 page CV. Materials should be emailed to sernw.grants@gmail.com. The last name of the applicant should start each file name. Both Microsoft Word documents and Adobe PDF files are acceptable. Complete information and instructions can be found on the Student Grants Page on the SERNW website. Check the Student Grants Page, and our Facebook page, for any updates or future grant announcements. The University of Washington and King County has a great opportunity for a temporary hourly Field Assistant. The two have come together to carry out a project entitled “Floating Treatment Wetlands Reduce Contaminants & Nutrients in Urban Stormwater Runoff”. The purpose of the research is to test coho mortality from direct stormwater and to determine the necessary contact time for stormwater with the floating wetlands to adequately remove metals and contaminants that will significantly reduce coho juvenile mortality and adult pre-spawn mortality. The field assistant will assist the Research Scientist to prepare for and conduct the experiment on juvenile coho this spring (planning on early March) and on pre-spawn coho this fall. This includes: help collect materials, assist with carrying out fieldwork and collecting necessary samples, record and analyze data collected, help organize testing and ensure quality standards are met. Preferred Requirements – undergraduate or graduate student at the University of Washington, 2-3 years of experience in related field work or study, and knowledge of water quality issues, wetland science, and/or restoration ecology. The position will be paid through the UW. Please send a short letter of interest and resume to Lizbeth Seebacher at lizbetha. Resumes will be reviewed starting on January 28th. For students at Friday Harbor Labs. We have been doing rolling admissions this year and already have the start of a crop of students for both the Zoobot program and the Spring Marine Studies (formerly Marine Biology Quarter) program, but we are seeking more recruits. I am (re) attaching our Spring flyers for those two programs, with one intended mostly for juniors and seniors with a strong biology background, and the other mostly for freshmen and sophomores who need some core courses with few prerequisites. Financial aid is available for both programs. Please give these flyers a look and send students (or questions) our way! Comments Off on Thinking of Spring! The attached describes an opportunity for undergraduate students to work/do research at Oregon State University’s Department of Wood Science & Engineering during summer 2019. Millions of people in the U.S. alone suffer from debilitating chronic pain. The Innovations in Pain Research Summer Program will expose 7 University of Washington undergraduate students to interdisciplinary research in pain to stimulate interest in future careers in pain research. This program will immerse undergraduate students in research to better understand pain and treatment mechanisms, develop new therapies, and improve access to evidence-based pain care. Undergraduates in biological sciences, psychology, nursing, social work, and/or engineering-related fields who are interested in exploring either basic science or clinical research in pain treatment are encouraged to apply. To attend our next Information Session, RSVP here. Thursday, January 10, 2018, 3:30 p.m. – 4:20 p.m.
For application and program Information visit our website here. Deadlines are rapidly approaching! Use our searchable database of programs at PathwaysToScience.org to find and apply to STEM paid summer research programs over winter break. Our database has over 650 paid summer research programs, including programs for both undergraduate and graduate students. 60 programs have deadlines in the next 45 days! Use our advanced search feature to filter by discipline, level of study, citizenship status, and more. If you need help finding a program, please email me with your level of study and disciplinary interests and I would be happy to help. Thank you and have a wonderful winter break. The mission of the Institute for Broadening Participation is to increase diversity in the Science, Technology, Engineering and Mathematics (STEM) workforce. We design and implement strategies to increase access to STEM education, funding, and careers, with special emphasis on reaching and supporting individuals from underserved communities and underrepresented groups, including underrepresented minorities, women, persons with disabilities, first generation college students, and students from underserved communities. The Institute for Broadening Participation is a 501(c)(3) organization, tax ID #20-1891162. Your contribution is tax-deductible to the extent allowed by law. To unsubscribe from all outreach emails from IBP, please reply with — unsubscribe — in the subject line. Undergraduate research opportunities from the Urban Water Innovation Network! The Urban Water Innovation Network (UWIN) is now accepting applications for its Undergraduate Research Program for the summer of 2019! Thank you for sharing this information with students who may be interested. See the attached flyer for posting. Students will be given the opportunity to perform cutting edge research of immediate relevance to people in urban areas at institutions in urban areas across the nation. Students with different research interests in urban water sustainability -social sciences, natural sciences, engineering – are invited to apply. The Urban Water Innovation Network (UWIN) offers its fourth Undergraduate Research Program (URP) for the summer of 2019. Participants will be given the opportunity to perform cutting edge, transdisciplinary research of immediate relevance to people in urban areas. Eligibility: Undergraduate freshmen, sophomores, juniors or first semester seniors. Must be citizens or permanent residents of the U.S. or its possessions. Underrepresented minorities and first generation college students are encouraged to apply. Other support: On-campus or nearby housing, travel assistance. The program starts and ends at Colorado State University in Fort Collins CO. Comments Off on Undergraduate research opportunities from the Urban Water Innovation Network! Please see attached announcement for a GRADUATE ASSISTANTSHIP for an MSc student at the University of Idaho (Moscow, Idaho). Please see the attached announcement from the USDA if you are looking for a post-doc opportunity. The field is soil science or agronomy. Here is a short message describing the important elements they are looking for: USDA has an opening, and they are looking for someone with training in meta-analysis, statistical programing in SAS, R GIS knowledge experience useful, data mining -database development. Looking for motivated undergraduate students to assist in data management for graduate students in the Quantitative Ecology Lab. Comments Off on Research Assistants Needed! Calling all College of the Environment undergraduates! FieldNotes (https://fieldnotesjournal.org/) is an undergraduate-run journal intended to increase public awareness of undergraduate research in the College of the Environment and provide a platform for students to actively engage in science communication. FieldNotes publishes two digital issues annually (Autumn and Spring quarters) featuring undergraduate research (feature articles and research communications) and community features, and contains vivid imagery to ensure multi-faceted storytelling which appeals to a broad audience. The first issue of FieldNotes was published in Spring 2018 (https://fieldnotesjournal.org/current-insights/). Questions? Please email rmfricke with the subject line: FieldNotes.